DALLAS, TEXAS (November 27, 2018) – Dallas Companion Animal Project (DCAP) has joined #GivingTuesday, a global day of charitable giving to support Pets for Life, an outreach program created by the Humane Society of the United States and funded by PetSmart Charities to address the lack of accessible and affordable pet care in underserved communities. 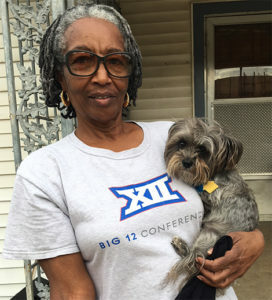 In some areas of South Dallas, more than 40 percent of people live below the poverty line, and cannot access much-needed services and supplies for their beloved pets. DCAP provides free veterinary services, including spay-neuter, supplies and information through the Pets for Life program to keep pets and families together. On a recent weekend, DCAP facilitated 200 spay-neuter surgeries. This fall, DCAP volunteers met Judy Drone and her 10-year-old Yorkie mix, Sasha, while they were in her neighborhood talking t o neighbors about their kittens. Judy could not afford to have Sasha sterilized, but didn’t want to contribute to the pet overpopulation problem. DCAP spayed Sasha at the beginning of November, and the beloved mama’s girl is back to her sassy self. Established in 2011, #GivingTuesday harnesses the collective power of individuals, communities and organizations to encourage philanthropy and to celebrate generosity worldwide. In 2016, millions of people in 98 countries came together to give back and support the causes they believe in. More than $177 million was raised online to benefit a tremendously broad range of organizations, and much more was given in volunteer hours, donations of food and clothing, and acts of kindness. Occurring this year on Nov. 27, #GivingTuesday is held annually on the Tuesday after Thanksgiving (in the United States) and the widely recognized shopping events Black Friday and Cyber Monday to kick off the holiday giving season and inspire people to collaborate in improving their local communities and to give back in ways that positively impact the charities and causes they support. Those who are interested in joining Dallas Companion Animal Project’s #GivingTuesday initiative can visit https://www.givebigdfw.org/organizations/dallas-companion-animal-project.